Physical inactivity is the cause of 1 in 10 deaths worldwide. We are in the midst of an inactivity and obesity crisis which is costing billions of dollars in unnecessary healthcare expenditures. The Centers for Disease Control and Prevention (CDC) estimates that approximately 86% of nationwide healthcare costs are used to diagnose and treat chronic diseases. Needless to say, something has to change! Decades of research prove that leading a physically active lifestyle is integral to good health. Simply put, an investment in staying physically active is an investment in staying well. And good health means lower healthcare costs. At a time when Americans are carrying the growing weight of their healthcare costs, they should have greater choice in how their healthcare dollars are spent. While America’s healthcare dilemma is complex and will require many solutions, passing PHIT will make staying physically active an easier and more affordable choice. The Personal Health Investment Today Act (PHIT - H.R.1267 and S.482) will allow Americans to use flexible spending accounts (FSAs) and health savings accounts (HSAs) to pay for health club memberships, fitness equipment, exercise videos, and youth sports leagues. If passed, it will allow individuals to use up to $1,000 per year to cover these expenses and families to use up to $2,000 per year. 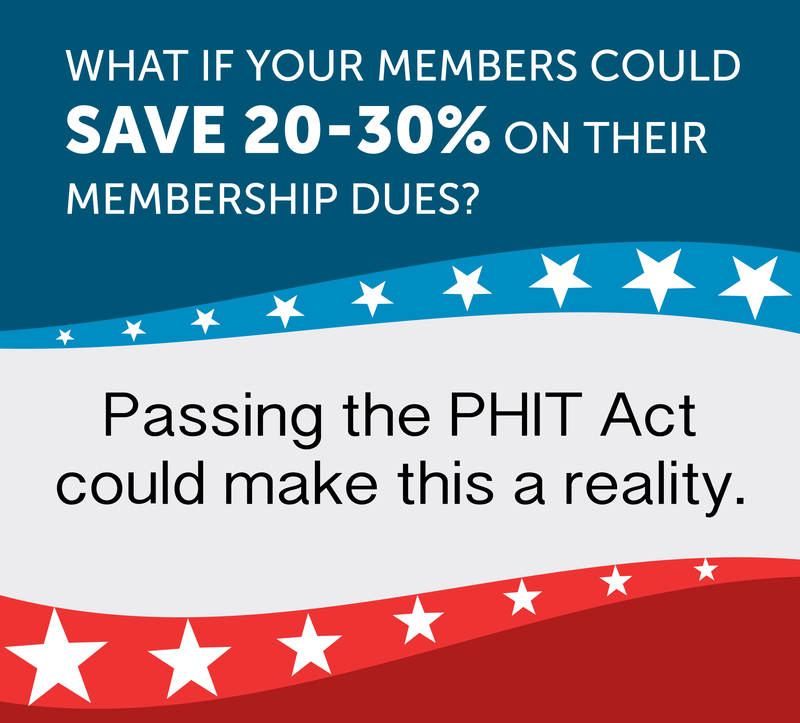 PHIT will help Americans save 20-30% on yearly expenses related to physical activity. Passage of PHIT will make being physically active an easier financial choice for hard-working Americans. Physical activity is a cost effective way to prevent and reduce chronic diseases such as heart disease, stroke and type-2 diabetes, which account for approximately 86% of nationwide healthcare costs. Under the current law, pre-tax medical accounts can only be used for certain expenses like prescriptions or doctor’s visits. PHIT will allow people to invest their money in disease prevention, not just on medical expenses. Physically active American’s are happier, healthier, and more productive.